TEEN TITANS GO! 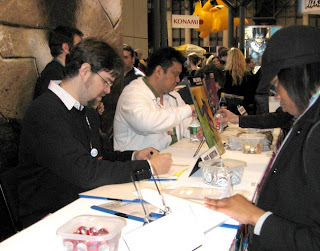 team was at full force at the New York Comic-Con. J Torres [writer], Todd Nauck [artist] and Mike Norton [artist] did a few group signings at the DC Booth during the show. 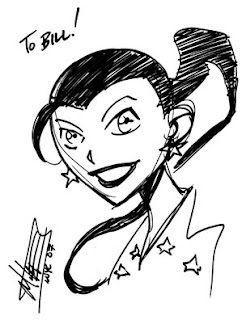 Mike drew me a Jericho and later, a Wonder Girl. 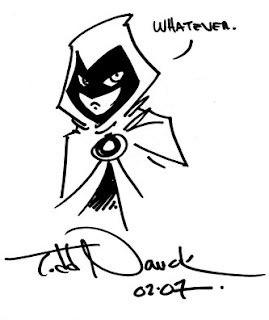 Todd drew me a cool Raven. 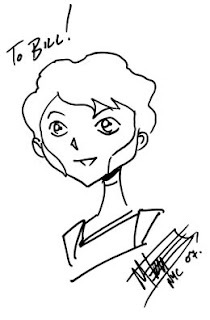 I was chatting with Todd about how they used Wonder Girl for the comic; He said they just called up Glen Murakami and he sent over a design for the character. Glen also provided the cover for her debut issue. J Torres said the TEEN TITANS GO! doesn't seem to be in any danger of cancellation, even though they aren't producing any new episodes. J also mentioned they have something special planned for TEEN TITANS GO! #50 -- so be on the lookout!